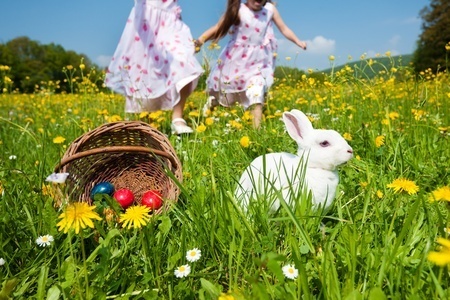 As the weather improves, Easter offers the first big opportunity for a family outing. But where are the best places to hunt Easter eggs this year? Chatsworth House is one of the jewels of the Peak District, boasting a historic house, an impressive art collection and 105 acres of sprawling gardens filled with treasures. And all of this is put to good use at Easter. From the 12th - 27th of April, visitors can hunt decorated eggs in the extravagant interior, and golden eggs across the garden. On Easter Weekend, the Easter Bunny arrives, bringing face painting and an Easter egg trail to the farmyard and adventure playground. If it's sunny this Easter, there will be no finer place to visit than this stunning 18th Century castle on the Scottish coast. As well as the castle, gardens, adventure playground and nearby beach, Culzean Castle is one of many National Trust and National Trust for Scotland properties partnered with Cadbury to provide a Cadbury Eggsplorer adventure. Kids follow tailored clues and answer questions to find their own personal (chocolaty) prize. If you're not near Culzean, you can find your nearest National Trust/Cadbury egg hunt here. If you're more Lindt than Cadbury, grab an Activity Pack at the Royal Botanic Gardens in Edinburgh to follow clues, learn about the flora and fauna across the site, and win an indulgent chocolate bunny. Which came first, the chicken or the egg? You'll find out if you visit Hove Park on the 13th of April. The Chicken Run is a 5km fun run for adults, and a 500m dash for children. Everyone must dress up in a chicken costume (provided) and everyone who finishes gets a chocolate egg to replenish their energy reserves. The ancestral home of the Dukes of Marlborough will play host to another esteemed guest over Easter: Peppa Pig. The porcine pal of many a youngster will be visiting on the 20th and 21st of April to celebrate '10 years of muddy puddles'. If you have no idea what we're talking about, you may prefer to visit on the 18th or 19th of April to participate in the Blenheim Palace Easter Egg Hunt, which invites children to solve clues around the Pleasure Garden to win prizes. Few hunts match the scale, scope or wholesome fun of this county-wide search for Peter's bounty, which promises exercise, fresh air, map reading and big prizes. To participate, simply visit the Peter Rabbit Egg Hunt website and donate at least £2 to Water Aid. When the hunt begins on April 16th, participants can use the Google Map provided to try and find one of 50 limited edition ceramic eggs hidden around the Lake District. As soon as eggs are reported found, they disappear from the map. Lucky egg-hunters can keep their loot, and also have the chance to win big prizes: including a trip to see the Peter Rabbit Garden at the Chelsea Flower show, and a luxury stay in the Lakes. If you're not lucky enough to win, you can always plan your own luxury trips, using our free Money Dashboard budgeting software to help you map out the costs.